Good Shepherd Episcopal School (GSES) in North Dallas is an independent coed school with 590 students from prekindergarten to eighth grade. We are accredited by both ISAS and SAES. The mission of Good Shepherd Episcopal School is to inspire students to learn with confidence, serve with compassion, and lead with courage. We have four signature programs that help identify us in the competitive Dallas independent school market: Classroom of the Earth (COE), a true outdoor experiential program offered to all our students from a nature hike in pre-k to our ten day Colorado backpacking experience for our eighth grade students; Learning Technology, with a1:1 iPad to student ratio from second through eighth grade used to enhance the curriculum, the SPARQ Innovation Space, technology electives offered in seventh and eighth grade; Spanish, with students from pre-k to eighth grade learning the language and culture and often placing out of freshman Spanish when entering high school; and Fine Arts, a three prong program, with the music program led by the President of the American Orff-Schulwerk Association, a strong competitive visual arts program, as well as a robust theater program. Good Shepherd prides itself on developing leaders as all students from pre-kindergarten to eighth participate in leadership roles from being classroom greeters to being a COE mentor for the younger students. At GSES service is important to us as we have a disaster readiness relief service project with outreach to areas experiencing natural disasters such as tornadoes or floods. 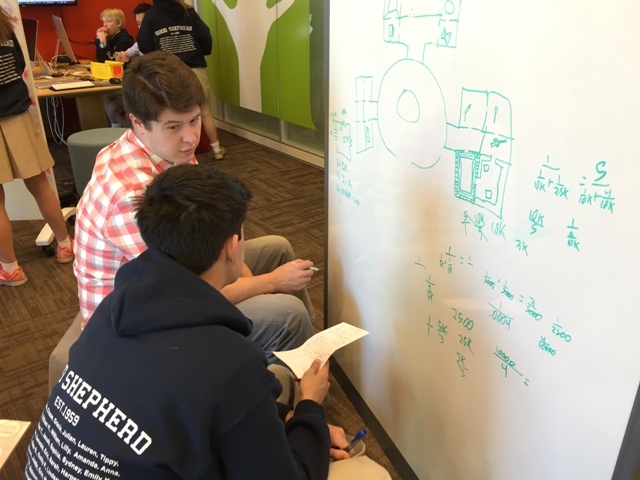 SPARQ (Solving Problems, Asking Real-world Questions) is located in the library, which is the central hub of our school. Occupying approximately 1500 square feet of space, we used “porous” borders of colorful, sound absorbing partitions. Inside, the furniture is moveable and modular with whiteboards on wheels, cushioned stools and benches, and a few small tables that can be separated or combined for flexibility. It also includes floor to ceiling windows along one wall where students can continue brainstorming with window markers and sticky notes. We also have a green screen space with special lighting and microphones for quality sound. The porous physical borders gave rise to SPARQ Without Borders. Our SPARQ teacher think tank coined this phrase to name the idea that the thinking and learning that goes on in SPARQ can and should happen everywhere in our school. As a first step toward this, we have created a series of optional design challenges and coding challenges that are sent out each month to the faculty. They can use them with their students as it fits into the rhythms of their classroom. The library has teamed with the SPARQ Without Borders concept to create maker kits that students can check out from the library to take home, thus continuing to extend the reach of the thinking and learning far beyond the physical confines of the space. SPARQ (Solving Problems, Asking Real-world Questions) is philosophically similar to maker spaces, Fab Labs and STEM labs. It is a place where students create and do first. While they are active, they are learning about the world and themselves as learners. It is also unique in several ways. First, it was specifically designed to inspire innovative thinking. Researchers note that innovative thinking is interdisciplinary. The silos of traditional school actually work against innovation, so our space has room for every subject area to participate in multiple ways. The thinking in the space is guided by Stanford University d.school’s design thinking model, which emphasizes empathy, rapid prototyping and deriving a strong question rather than jumping to solving a problem. Several of our teachers were accepted into Stanford d.school’s workshops and have traveled to Palo Alto for the training. The second way our space is unique is that we have powerful mix of low tech and high tech tools. We believe that the types of tools available influence the way students think about and solve problems. Thus, it is important that we have a variety of tools, from cardboard for rapid prototyping and building to sticky notes for brainstorming to 3D printers to make their creations come to life to arduinos so they can program anything! We have even engaged our facilities folks in projects that required more traditional tools such as saws and drills! This mix offers many options for students but does not lead the thinking. Finally, our space is unique because it was designed so that all of our students, from PreK through 8th grade, could participate fully. We preferred an inclusive space and identified multiple points of entry to scaffold younger or less experienced students as they use a tool to accomplish their goal. Our 8th grade Technology class designed a challenging robot course using LEGO NXT Robotics to share with our 5th grade. The 8th grade spent two days brainstorming, and built the actual course with cardboard, foam board, and foam gymnastics cubes. 5th Grade, who was celebrating the Hour of Code, tried to program their robots to conquer all 4 tough challenges put forward by our 8th grade. Eighth grade science used the collaborative and technology-rich SPARQ space to research and explain the “Origin of the Universe” from well known differing points of view. The unit culminated in a mock debate. The SPARQ Technology class continues it’s independent student studies which include X-box game design, flight simulations to help design a better craft using the 3D printer, furniture design and production, blog posting, a virtual scale model of the GSES’s future campus, arduino design, and a music video production. All will be shared with the community. Third grade focused on coding with WEDO robots. They built robots that could kick a ball, and then they programmed them to do just that. The class competed to see which robot could send the ball the most distance to “kick off” the Christmas Break! 6th graders came in to learn about the Stanford d.School design process with a timed building challenge to build a tall tower with limited materials. Collaboration and prototyping were emphasized. Also, 2nd graders came in to take on a design challenge with note cards to build a pedestal to support a doll. They too discussed the process of ideation, prototyping, and testing. Of most importance is that these experiences are inspiring similar flow to occur in the PK – 8 classrooms campus-wide. Also, increasingly, students are using the space independently as they ask the SPARQ coordinator to work with them directly to meet the student’s interests. As we consider our future with SPARQ, we have some aspects that we want to maintain. We believe it is important to continue SPARQ as an incubator for fostering innovative thinking and learning across the school. While we want the type of thinking and learning that students do in SPARQ to happen across the school, we understand that educational change is more respectful when we all have an opportunity to try things out – or prototype – our way into our new understanding of the roles of learners and educators. SPARQ allows for that prototyping in a safe place. We would also like to keep SPARQ in the library. We appreciate the synergy that exists between the type of thinking that happens in SPARQ and the type of thinking that happens in the library. We have seen many benefits to our location in the library! We have two changes that we are considering as we learn from our space. First, we might consider a satellite space for louder tools that are challenging in the library. We are also considering installing a door to the outside from within SPARQ to extend the possibilities of thinking and learning outside.